Major General Horatio Robley was a military man who was also a writer and illustrator. His 1896 book, Moko, or Maori Tattooing is the standard reference for Moko or New Zealand Maori Tattooing. Moko was unique in that the face was decorated with intricate spirals that were not only tattooed but also incised into the skin to make scars in the form of parallel ridges and grooves. With the exception of slaves and commoners, all men were tattooed on the face and most were also tattooed on other parts of the body. An elegantly tattooed face was a source of pride to the warrior, for it made him fierce in battle and attractive to women. Women were also tattooed, but not as elaborately as the men. Lips outlined and tattooed solid blue were considered beautiful. The chin was also tattooed, and sometimes a few lines or spirals were worn on the cheeks or forehead. 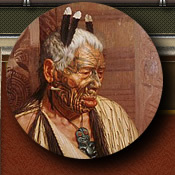 One early explorer reported seeing Maori women complete with facial tattooing like that of the men, but this was rare. Moko designs consisted of a series of traditional components, each of which had a name. Maori chiefs were able to draw their own facial tattoos accurately from memory, and used them as signatures. The tattooing instruments used by the Maoris were small chisel-shaped pieces of bone, shell, or metal that were dipped in pigment and then struck with a mallet. In order to get the scarred ridges and grooves that identified moko it was necessary for the instrument to penetrate deeply into the flesh, and cuts were sometimes so deep that they went through the cheek. The pain was intense and there was a lot of blood, but it was a point of pride with Maori warriors never to flinch or make a sound while being tattooed. The Maori took tattooed heads of their enemies as trophies during war and kept them in ornately carved ceremonial boxes. In the first decade of the 19th century, Europeans made regular contact with Maori tribes along the coast. By 1814, three missionaries decided to convert the Maories and one chief named Hongi was brought to England with a missionary, where he worked with a professor from Oxford to write a bilingual dictionary and translate the bible into the Maori language. When in England, Hongi was presented to polite society who admired his tattoos and King George IV granted him an audience and presented him with a trunk full of gifts as a reward for his efforts in spreading the gospel. On his way back to New Zealand, Hongi stopped off in Sydney, where he exchanged the King's gifts for several hundred muskets and a large supply of ammunition. When he returned to New Zealand, he used his muskets to launch a series of raids against his traditional tribal foes. For a time his enemies were unable to resist him. Muskets were expensive, and Hongi's enemies had little to trade for firearms. A ton of flax, which had to be laboriously scraped and dressed by hand, bought only one musket. The Maoris soon discovered, however, that European traders would trade a musket for a tattooed head. Soon Maori warriors made raids on neighboring tribes for the sole purpose of obtaining tattooed heads to trade for guns. The traders sold them to museums and private collections in Europe. As more Maoris acquired muskets, more heads became available, and business prospered. The supply of guns was inexhaustible, but the supply of heads was not, and before many years the Maoris were getting desperate. Slaves and commoners captured in battle were tattooed and killed so that their heads could be sold. And even heads of poor quality, with mediocre or unfinished tattooing, were offered for sale. Major General Horatio Robley is perhaps most well known for his eccentric collection. Robley decided to acquire as many mummified the tattooed heads as possible. Over the years he built a collection of 35. In 1908 he offered them to the New Zealand Government for £1,000 but his offer was denied. Today, 30 of his heads are in the collection of the Natural History Museum in New York. The Maoris were forced to give up their territory with the expansion of British settlement and they lost interest in tattooing and other traditional skills. In 1873, an artist named Gottfried Lindauer (1838-1926) arrived in New Zealand and was fascinated by the Maori. By the end of the 19th century, he had completed over 100 portraits which are now part of a priceless collection of the Auckland Art Gallery. His work is of great historical value because it is a precise record of some of the most artistic and sophisticated tattooing which was ever produced. Many of the Maori individuals who sat for their portraits had played leading roles during New Zealand's formative years. "The marks in general are spirals drawn with great nicety and even elegance. One side corresponds with the other. The marks on the body resemble foliage in old chased ornaments, convolutions of filigree work, but in thee they have such a luxury of forms that of a hundred which at firs appeared exactly the same no two were formed alike on close examination." A draughtsman employed by Joseph Banks; Sydney Parkinson gave accounts on moko as it was in 1769. He said, "As to tattowing, it is done very curiously in spiral and other figures; and in many places it is indented into their skins which looks like carving, though at a distance it appears as it has been only smeared with a black paint." The mode of tattooing practiced by the Maoris was unlike that of any other race, and their artistic designs were arranged so that the skin of the face was often completely covered up to the corners of the eyes, and even over the eyelids; and that the stains, though tending to diminish in brilliancy, were indelible. Moko for Maori men made attractive to women and conspicuous in war. The great chiefs had their faces and bodies covered with designs of extreme delicacy and beauty; and all the men, except the slaves, were decorated with blue-black.